Our new cermet tipped stainless steel cutting saw blade is designed for cutting various grades of stainless steel up to 316. 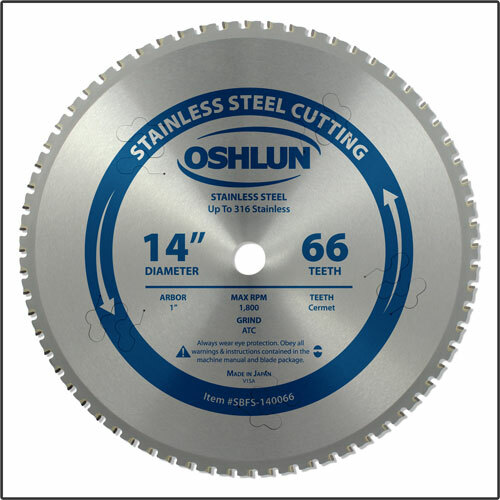 This blade is to be used only on low RPM dry cut saws and will produce clean cuts with less sparking and edge burrs when compared to other cutting methods. The specially formulated cermet tips provide an extended cutting life in a material that is extremely difficult to cut. Other blade features include a tensioned and hardened steel plate with silicone resin filled anti-vibration slots for less vibration and noise. Made in Japan. NOTE: Different grades of stainless steel will cut differently resulting in a longer or shorter blade life dependent on the material being cut. Stainless steel grades from 303 up to 316 become increasing difficult to cut as the grade number increases which will result in faster dulling of the blade. Never use on saws that run above the rated MAX RPM. Proper clamping devices should be employed. Follow all safety instructions.